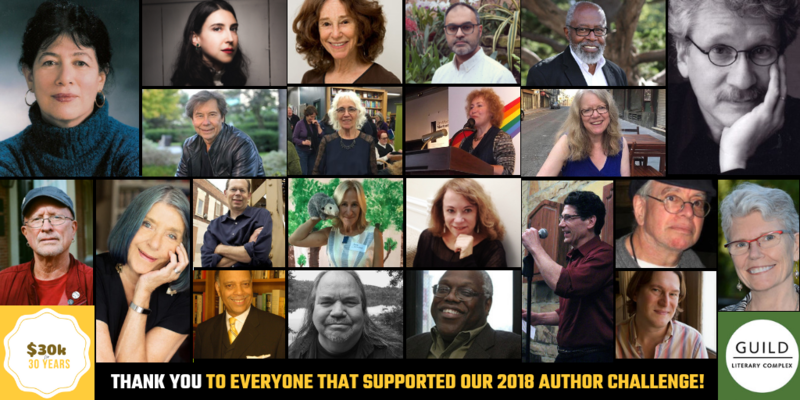 THANK YOU FOR MAKING THE 2018 AUTHOR CHALLENGE OUR MOST SUCCESSFUL YET! The success of the 2018 Author Challenge means that we are starting 2019 already more than 40% of the way there! The Guild Complex is a registered 501(c)3 nonprofit organization. Your financial support makes everything possible. It helps ensure that our unique, cross-cultural programs continue to provide an outlet for Chicago’s established and emerging artists and writers, and opportunities for provocative conversation between artists and audiences. It helps us with things like paying featured artists and awarding contest prizes, renting space for rehearsals and performances, hiring videographers to share event footage with new audiences, and keeping low ticket prices to all our events. The Guild Complex is a registered 501(c)3. Your donation is tax deductible to the fullest extent of the law. Thank you! We look forward to making great things happen here in Chicago with your generosity.